The Cuban exile paramilitary organization known as Alpha 66 was first organized and founded in Puerto Rico in 1961 with 66 men. The group was created with the intention of maintaining the fighting spirit of the Cuban people after the Bay of Pigs Invasion. General Secretary Andrés Nazario Sargén was a founder of Alpha 66 along with other prominent anti-communist fighters such as his older brother Aurelio Nazario, Eloy Gutiérrez Menoyo and Antonio Veciana. Other organizations joined this armed struggle against Cuban communism, and thus began the first movements and incursions into the Cuban coast. In 1962, the Second Escambray Front (Segundo Frente del Escambray – SFE) and Alpha 66 became one, with Veciana as a coordinator and Gutiérrez Menoyo in charge of the military training. Later, Alpha 66 joined forces with the Revolutionary Movement of the People (Movimiento Revolucionario del Pueblo – MRP) in the Revolutionary Alliance (Alianza Revolucionaria). In 1964, the Revolutionary Alliance executed “Plan Omega” that involved situating a well-equipped guerrilla force inside Cuba. Delegations from California, Florida, New York, Puerto Rico and Venezuela assembled a War Council carrying out propaganda and finance operations with the slogan, “El Plan Omega está en marcha” (“The Omega Plan is in motion”). The central goal was to overthrow the Castro regime in Cuba. “El Plan Omega” failed, and Ernesto Díaz, Pedro Rodríguez, and Eloy Gutiérrez Menoyo, were captured along with three other Alpha officers: Domingo Ortega, Ramón Quesada Gómez, and Noel Salas Santos. After their capture, broadcast and propaganda campaigns were launched to gain release for these political prisoners. Their failure and imprisonment affected many of the rebel groups in Cuba and the Cuban exile community as a whole. The previously fiery enthusiasm diminished, and the Revolutionary Alliance split up, reduced once again to merely The Second Escambray Front and Alpha 66. In 1965 El Correo, Alpha 66’s bulletin, announced that the new commander in chief would be Dr. Armando Fleites Díaz, who was dedicated to continuing the fight and rebuilding military strength. The renewed force initiated new paramilitary campaigns and fundraising for ships and military and radio equipment. Alpha 66 persisted in organizing and executing military operations, sabotages, and creating clandestine cells on the island. Many officers and members were killed during these infiltrations. In 1970 Coronel Vicente Méndez died in combat, and Aurelio Nazario was captured and executed. After the 1970s, Alpha 66 restructured its underground network. New members were recruited and political activities implemented. The organization established the “Plan Máximo Gómez” in 1980 to promote internal destabilization in Cuba. As of 2010, Alpha 66 continued to operate from its headquarters in Miami, continuing to advocate for an armed civil uprising in Cuba. 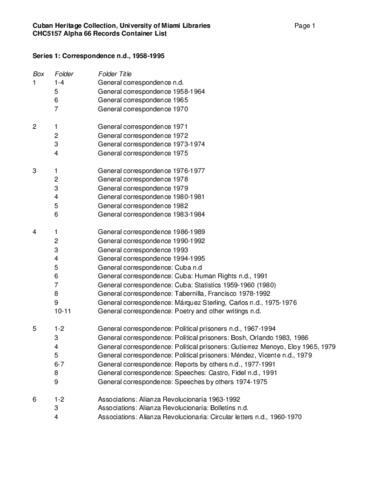 The Alpha 66 Records document the political, propaganda, paramilitary, and administrative activities of the organization as collected by Andrés Nazario Sargén, one of it's founders and longtime leaders. The Records include correspondence, circular letters, financial records, clippings, maps, photographs, press releases, proclamations, programs, propaganda, and reports. The Alpha 66 Records are organized into five series. Please see the "Detailed Description" and "Box and Folder Listing" sections for more information. This collection is open for research. Access to Boxes 19 and 20 is restricted until 2038. Gift of Andrés Nazario Sargén, 2004. Materials added by gift of Olga Nazario, 2005. El Combatiente: Organo oficial del Alpha 66. Delegación de New York, n.d.
Patrocinadores de la Libertad Alpha 66 n.d. This collection was processed with the support of the Miami-Dade County Department of Cultural Affairs and the Cultural Affairs Council, the Miami-Dade County Mayor and Board of County Commissioners.